ME provides quality services and supports activities which enable younger chemists to become effective leaders in the profession and the Society. Through the coordinated efforts of the NP, IP and LRA working groups, ME strives to fulfill the YCC mission of advocating for and providing resources to early-career chemists and professionals in the chemical sciences and related fields. The LRA working group coordinates and supports local and regional younger chemist activities. LRA works with ACS Regional Meeting area younger chemists to incorporate programming and activities of interest to our constituents. Additionally, LRA supports the creation and mobilization of Local Section YCC’s (LSYCC’s) to provide leadership opportunities for and increase involvement of younger chemists in their ACS Local Sections. Identify and oversee YCC National Meeting programming. Session planning is open to younger chemist organizers and National YCC members to meet constituent needs. Work with Divisional Liaisons to identify programs of constituent interest and benefit. Prepare National Meeting Roadmap prior to each meeting. Along with programming, NP also plans National Meeting activities (e.g. Fun Run, receptions) and special events (e.g. Anniversaries, Awards/Recognition). The IP working group plans and coordinates activities including both international virtual and physical exchange programs (iVEP, iPEP), with the goal of helping both local section and international younger chemists make connections and build professional relationships in other countries. GIO is here to engage with the Society on behalf of the Younger Chemists Committee and our constituents. 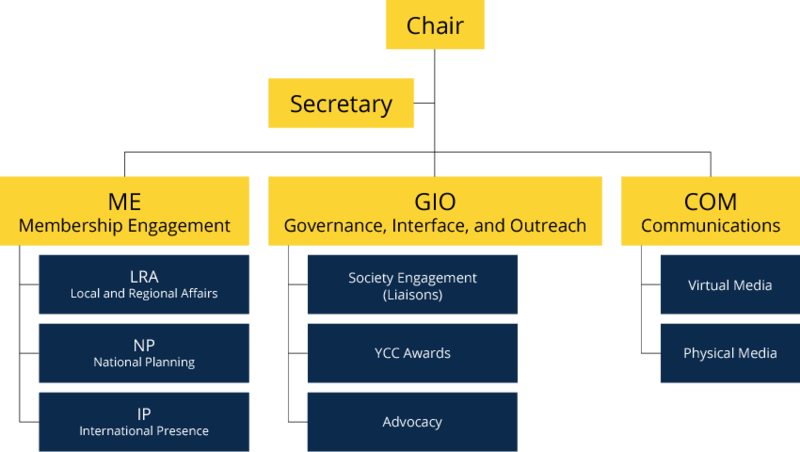 GIO identifies, appoints, and manages constituent representation for the YCC throughout the ACS governance structure (liaisons, appointed roles, etc). GIO is also responsible for recognizing outstanding younger chemists in the Society and disseminates awards for supporting participation at National Meetings, extraordinary scholarly achievement, as well as leadership and other training opportunities. The Communications Subcommittee is responsible for informing the Society's younger members of YCC programs and activities and for providing information and advice relevant to their professional development. The main venues are Social Media (Facebook, Twitter, LinkedIn), the YCC website (you are here!) and the YCC Newsletter. The communications subcommittee is committed to working efficiently and effectively with the other two YCC subcommittees to serve the goals of YCC, and spread the word about the exciting things happening in YCC!